Teachers may have been murdered by right wing death squads in the past year in Honduras, where one of the most corrupt elections in memory returned to power a government favored by the Obama administration, but according to The Wall Street Journal, the problems in the hemisphere are teachers in Mexico. Their crime? Militant protests against the corporate "school reform" agenda that the Mexican government is trying to impose on the country, imported directly from the USA. 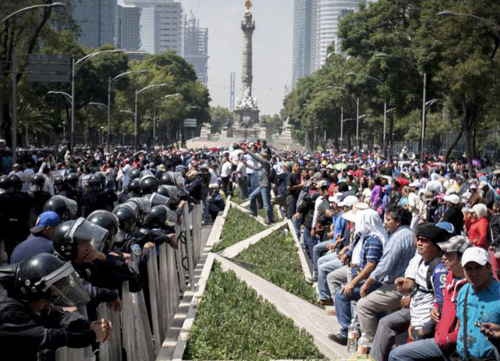 Mexican teachers (right) were standing up against corporate "education reform" on October 13, 2013, in the face of massive police attacks on their protests. "Since August, the union [the National Coordinator of Educational Workers, CNTE], steeped in Marxist ideology and a proponent of class conflict, has blocked access to national highways and established huge tent cities in Mexico City," a front page Wall Street Journal story reported on December 10, 2013. The story, "A Radical Teachers Union Gives Mexico a Harsh Lesson", was front page teacher bashing propaganda. Sourced almost completely with anonymous "intelligence sources" and right wing advocacy groups (Mexico's equivalent to outfits like the Heritage Foundation and the "School Reform Department" of the University of Arkansas), the story presents itself as news, but is a major piece of propaganda. The subtlety of the propaganda is barely masked. Using unnamed sources, the reporters assures the readers that some of the teachers may be linked to terrorists. "The union's ability to mobilize tens of thousands of teachers gives it enormous power over state governors, forcing large financial and labor concessions years after years, analysts say. Mexican intelligence documents reviewed by The Wall Street Journal say some of the CNTE leaders may even have links to a showy guerilla group, the Popular Revolutionary Army, Or EPR, which authorities say has engaged in kidnapping businessmen..."
The report in The Wall Street Journal even has a hint of portraying the Mexican teachers as the kinds of "banditos" of American Wild West stories. They even have a "hideout", at least according to the reporting. And while Substance reporters have recently returned from Honduras, where a rigged election returned a corrupt coup d'etat government to power (with the blessings of the Obama administration), it is the teaches in Mexico that are being red baited and accused, based on anonymous (but "authoritative") sources of "kidnapping businessmen." Doubtlessly, Bruce Rauner and others have already begun re-cycling the latest Wall Street Journal version of plutocratic reality. COMPLETE WALL STREET JOURNAL STORY. FRONT PAGE DECEMBER 10, 2013, NATIONAL EDITION. Radical Teachers Union CNTE Gives Mexico a Harsh Lesson. Powerful Group Fights Government on Sweeping Overhaul of Educational System. By Jos� de C�rdoba. The URL is: http://online.wsj.com/news/articles/SB10001424052702304607104579213982652302644? SAN LUCAS QUIAVINI, Mexico�During a recent teachers strike in this Zapotec Indian town in the poor southern state of Oaxaca, parents who brought in replacement instructors discovered that the children hadn't been taught the words to Mexico's national anthem. Instead, they had been trained to sing a popular leftist song which acts as an unofficial anthem to a local chapter of the teachers union. The union here is the National Coordinator of Educational Workers, or CNTE, a radical and powerful wing of the country's national teachers union. Analysts say it has long maintained an iron grip over some of Mexico's poorest states�one that goes beyond what children are taught, and extends to lengthy strikes, disruptive protests and violent clashes. Now, as Mexican President Enrique Pe�a Nieto begins to implement an overhaul of Mexico's troubled public school system, the CNTE has stepped up its efforts to fight the government. Since August, the union, steeped in Marxist ideology and a proponent of class conflict, has blocked access to national highways and established huge tent cities in Mexico City to house protesters. Union teachers have also clashed with police, burned cars and blocked the entrance to Congress�forcing legislators to meet in a nearby racetrack. And during these protests, the CNTE's legendary strikes�held every year or so for three decades�lasted for months this fall, shutting down schools for millions of children. The union's ability to mobilize tens of thousands of teachers gives it enormous power over state governors, forcing large financial and labor concessions year after year, analysts say. Mexican intelligence documents reviewed by The Wall Street Journal say some of the CNTE leaders may even have links to a shadowy guerrilla group, the Popular Revolutionary Army, or EPR, which authorities say has engaged in kidnappings of businessmen. The union denies such links, calling such accusations political slander. The union's stance illustrates the kind of obstacles that Mr. Pe�a Nieto, who just marked his first year in power, faces in trying to modernize the country and upgrade its sluggish economy. In addition to the new education law, his government has passed legislation to boost competition in telecommunications and improve governance. It is also poised to open up Mexico's nationalized oil industry to private investment. But analysts say special interests, vestiges of Mexico's old corporate state, from big business to labor unions, often stand in the way. The country's unions, for decades the mainstay of the ruling Institutional Revolutionary Party or PRI, have remained largely untouched even as the country has opened up to global competition abroad and political competition within. Some analysts believe that Mr. Pe�a Nieto, who has been largely silent about the teachers' resistance to educational reform, will choose not to apply the law to states dominated by the teacher's group. A presidential spokesman dismisses that, saying there is "no possibility" the government will make a pact with the teachers or not apply the law. "What's at stake is the capacity of the Mexican state to have the rule of law obeyed," said Alberto Serdan, of Mexicanos Primeros, an education think tank. "If the Mexican state can't do it on education�which is crucial to the formation of citizens�what can Mexican society and international investors expect?" On its website, the CNTE says it is a "mass organization formed by educational workers" and "independent of the bourgeoisie and its state." Many of its members consider it to be a revolutionary movement fighting for the poor and powerless against the rich and powerful in Mexico. The "movement," as CNTE teachers call their union, is on a crusade to stop the Mexican government's educational reforms, which it says are aimed at "privatizing" education. The CNTE, which union members say has about 250,000 members, was formed in 1979 to fight for union democracy within the National Union of Educational Workers, Latin America's largest union with some 1.3 million members. For most of its history, that union has been a key cog in the PRI's political machine, and one of the most powerful institutions in the country. CNTE leaders say Mexico's government is a criminal organization, which has no moral right to criticize it. "The government, which for decades has sunk the country in the most abject misery, has no right to accuse us of anything," says Rogelio Vargas, a leader of Section 22, the union chapter in Oaxaca. "They say the CNTE extorts, but the oligarchs of Mexico's political class are the worst extortionists; they steal billions of pesos from the country every year." The government dismisses Mr. Vargas' charges and says that teachers shouldn't fear the government's reforms. According to the CNTE's website, union members need an 80% grade for participating in "the current struggle" to be eligible for "scholarships, loans, job changes, promotions, job hiring and rehiring" the union largely controls. Some CNTE teachers say that the union essentially forces them to take part in monthslong marches and sit-ins. On the site, a 40-point list of proclamations excoriates by name teachers and local officials who it says have betrayed union principles. Mr. Vargas says it is only fair the union rewards teachers who help win union benefits. "The benefits that I get by protesting you won't benefit from if you don't take part in the protests, period," he said. In Oaxaca, the heart of the CNTE's power, some 74,000 teachers, office and maintenance workers belong to the union. The state, among Mexico's poorest, has virtually no major industry, relying on tourism, commerce�and education, which takes up 49% of the state budget. Payroll for Section 22, the CNTE union chapter there, runs around $1 billion a year, or 98% of the education budget, which is almost totally paid by the federal government. Adding to the CNTE's clout: About a fifth of all mayors in Oaxaca's 570 municipalities are teachers. The CNTE's control in Oaxaca was sealed in the early 1990s when the union organization signed an agreement with the government then that, according to public records, gave the CNTE the right to propose, name or approve almost all the officials in the state education ministry�effectively handing over control of education to the union. The teachers have the governors "under their thumb," says Jose Antonio Crespo, a political analyst at the CIDE think tank in Mexico City. Gavino Cue, the governor of Oaxaca, didn't respond to requests for comment. Strikes are a yearly rite of spring. This year alone, the conflict kept 1.3 million children in Oaxaca out of classes for two months. Since returning to the classroom, violence has picked up. Twice in recent weeks hundreds of returning Section 22 teachers threw rocks and set off homemade rockets to dislodge parents and nonstriking teachers from four schools the teachers left to go on strike, according to authorities. After the melee, union officials said in televised newscasts that the attacks were within the union's right to fight for its own survival. "We are going after all of the schools," said Jose Alfredo Martinez, a Section 22 leader after driving off parents and teachers from a rival nonstriking union local, interviewed on Milenio TV. The CNTE has vowed to overturn Mr. Pe�a Nieto's education overhaul, which was prompted in part by the country's continually low ranking in world surveys on student achievement. Among the changes, the overhaul requires teacher evaluations; opens up the teaching profession to professionals who aren't graduates of teaching colleges; and ends common practices such as handing down teaching positions from parent to child. But Mexico has long had a reputation as a country that is better at passing laws then enforcing them, and union officials aren't shy about stating their objectives. "We don't care what the law says because we are going into civil disobedience mode," said Roberto de la Cruz, a union organizer in Oaxaca. "They don't dare apply the law and throw 74,000 of us into the street. They can't do it." Mr. de la Cruz said the government wants to use the evaluations to show the teachers "to be donkeys and then to fire us." At the Benito Juarez primary school in Mitla, parents rebelled against Section 22 teachers during the recent strike, turning the school over to nonstriking teachers from the much smaller rival union. Parents also kicked out Section 22 teachers at schools in San Lucas, not far from Mitla, also replacing them with nonstriking teachers. In San Lucas, a town where many of the men migrate to work in Los Angeles, parents complained about the quality of education, saying it was both bad and politicized. Rosario Martinez, the head of the parents association, said that aside from politics, the teachers did little teaching, and rarely used textbooks. "The children are very damaged," she says. "They don't know how to multiply or divide. They can read, but very little. They get stuck on words." Photographs found by the parents showed that a teacher organized plays and dances where students dressed up in black balaclavas and carried wooden rifles typical of the Zapatista rebels, who staged a brief uprising against the Mexican government in 1994. For his part, Mr. Vargas, the union leader, blamed any poor schooling on the state's poverty and on the government for not giving education enough resources. He denied that teachers had replaced the singing of the Mexican national anthem with the leftist song. But he said there was nothing wrong with dramatizing the Zapatista uprising. "It's part of our history," he said. He also said the strikes are necessary to stop what he says are the government's attempts to privatize education. From 1997 to 2008, students in Oaxaca missed 172 days because of strikes, almost the equivalent of a school year, according to data compiled by Luis Tapia, an education expert at Mexico's FLACSO think tank. Children in neighboring Guerrero, where the CNTE is also strong, fared second worst, with a loss of 125 days. "Oaxaca and Michoac�n [another southern state where the CNTE is strong] live in the Middle Ages of education," said Claudio X. Gonzalez, the president of Mexicanos Primero, the educational think tank, at a recent speech. Along with educational funding, state documents show that Oaxaca's government also gives millions of dollars to community groups run by union-affiliated activists, which lobby the government for money for social projects. Grants to these groups�which use the money to help solidify their control in communities�are rarely or ever supervised or audited, say three former top Oaxaca government officials. Last year, for instance, the Popular Revolutionary Front, a unit of the Communist Party of Mexico, Marxist-Leninist, which says it coordinates many of its activities with Section 22, received $3.2 million from the Oaxaca state government for an office building, cars and a swimming pool in an eco-tourism project, Oaxaca state government documents show. "It's an absolute swindle," because the money isn't going to proper use, says George Grayson, a Mexico expert at the College of William and Mary in Virginia. Mr. Vargas, the union official, denies that, saying the money is audited and isn't tied to unions. "That's a lie," he said. More troubling to many observers, top former Mexican officials say some CNTE leaders over the years have had close links with guerrilla groups, most prominently the EPR, which has its roots in guerrilla organizations that have been active in the mountains of Guerrero and Oaxaca since the 1970s. Since 1988, the EPR and its previous incarnations have been credited by authorities with more than 30 kidnappings, including the 1993 kidnapping of Mexico's then richest banker. In 2006, Oaxaca was beset by raging street battles for five months after police failed to break up a teachers' strike. Mexican intelligence documents reviewed by The Wall Street Journal said that five CNTE leaders had links to the EPR, which analysts believed tried to piggyback on the unrest caused by the strike that year. Today, two teachers, who are members of the CNTE, and three social activists with ties to the union, are in prison facing charges of involvement in a violent kidnapping of children early this year that former intelligence officials believe could have radical political overtones and be linked to the EPR. In January, according to authorities, armed men ambushed a car and grabbed two children of a local Oaxaca businessman as they were being driven to school. They shot the driver in the face and left behind a third child, a girl, covered in the driver's blood, Mexican authorities say. The children, ages 11 and 15, were kept shackled in a makeshift cistern under a safe house for four months. In May, Mexican police raided the hideout, freed the children and arrested 12 people. All have pleaded not guilty and the CNTE says the two teachers and three activists are "political prisoners." The union, which denies any role in the kidnapping, has made their release a key demand of almost daily protests that have laid siege to Mexico City and other parts of the country for months. Outside union headquarters in Oaxaca reads a huge banner, defending the teachers accused of kidnapping: "Liberty for the political prisoners of the CNTE."